When someone fills in the contact form on the website, only there name shows up. No phone, email or address. Nothing was changed to the site. According to my checks on your form, you have no "Required" field to force users to fill. If you leave fields' un-required and then, the user doesn't fill those, your notification mail comes like your screenshot with blank values. 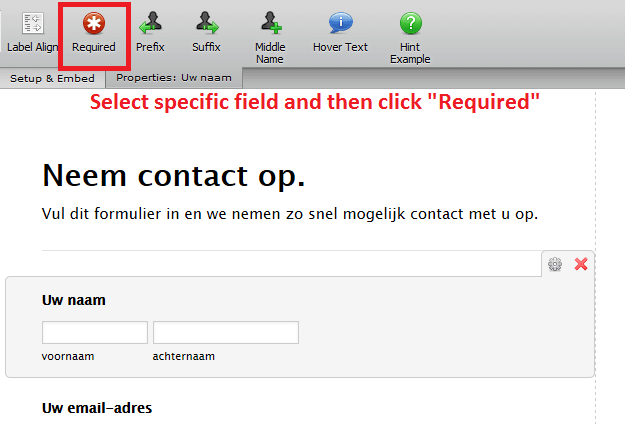 To force users to fill one of your field, you need to make it "Required". Please don't hesitate to ask, if anything stays blank. Where do I see that setting? My original web guy is no longer. After I click required, I now get this. I can't see the attached image but; after setting the field as "Required", you will get the following error message and it is not allowed to submit a form without completing them. I was clicking on the right side and not the field. Now I clicked on the field and there is a red * but still only showing my name when form is submitted. I don't get that message when I click on the field. Please, share the browser you use for this operation. I suggest you to use Chrome, because some browsers like Internet Explorer has issue with scripting, that's why you can't see the error messages. I logged in in Chrome and still cannot see. Can you connect to me to check? I have inspected your form and you have a lot of fields inside of your form. However when I checked your email Notification I saw that you have only six fields inside of email Notification settings and only value of name field is set correctly. Because of that you are only receiving data from name field when your form is submitted. I would suggest you to create new Email Notification and delete old one. When you create new Notification all fields and values of fields will be automatically added inside of your Email Notification. Only sending name on submission. No other info. I have inspected your form http://www.jotform.me/form/53123309261446, but you did not create new email Notification. Old Notification is still there.